Seattle Xcoder and indie dev Gus Mueller keeps trying to make WebAssembly happen. He may be right about it! NSCoder Night Seattle is tonight (and every Tuesday night) at Wayward Coffeehouse: 6411 Roosevelt Way NE, 7-10 pm. Seattle Xcoders organizer Tim Ekl writes Swift Generics Evolution. We don’t know what that means, but we’re intrigued. See you there! I’ll show how to walk through a collection of Wikipedia articles, use a bunch of tricks to extract spatial data, clean things up in a true database (PostGIS), and then emit JSON that gets processed into a Core Data datastore. This is a mix of Swift, Python, and SQL. NSCoder Night Seattle is tonight (and every Tuesday night) at Wayward Coffeehouse, 6411 Roosevelt Way NE, 7-10 pm. Bring your laptop and your project. All levels welcome! It’s fun to help people, and it’s fun to get help. Reminder! Tonight is the Redmond Xcoders meeting. We’re not holding a real meeting — we’re just gathering at the Cyclops in Belltown around 6:30 pm. Be there! Don’t be shy! We’ve got a lot to talk about this week! Reminder — Seattle Xcoders is meeting tonight! The talk is “Dynamic Development with LLDB” by Geoff Pado. It’s Pi Day. Let’s get irrational. WWDC will be June 3-7 in San Jose. The next meeting — on Monday, March 25 — features talks by Tim Davis of Logic&Form and Colin Caufield of Flipboard. See the meetup page for more details — and to RSVP. 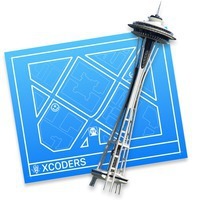 Due to a cancellation, we need to find a speaker for the March 14 meeting of Seattle Xcoders. If you might be interested, please email mailto:info@seattlexcoders.org. The Xcoders audience is wonderful — everyone is rooting for the speaker! If you’ve never spoken before, or have done so only a few times, Seattle Xcoders is a perfect place to get better at it. And we’re also welcoming to folks who are beta-testing a talk they’re planning to give at a conference. The meeting starts at 7 pm at Thinkspace. See the meetup.com page for this event for more details. Vancouver Xcoders has started posting videos! One is “UI Testing on iOS” by Malin Sundberg; the other is “Introducing Quests” by Allen Pike. Seattle Xcoders will be going to the Cyclops this week — Thursday, Feb. 28, 6:30 pm — for an unofficial meeting. Not a meeting at all, in other words. Hanging out and talking. Join us! I’m pleased to announce Ejector, an app that gives new purpose to your ⏏️ key. Without a CD drive, this key does nothing; now it shows all your mounted drives and volumes and helps you eject them. The app has a 7 day trial, and costs $10. Xcoders blogger Brent Simmons is interviewed on The Omni Show. © 2018 Xcoders. Follow @xcoders on Micro.blog.